Another great thing about being in Basel is getting to peruse the international sibling sites of some of my favorite go-tos. 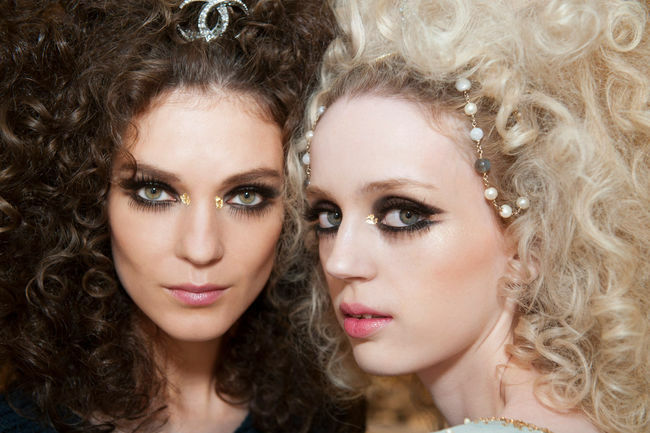 In this instance, thanks to German Vogue, I stumbled upon Chanel's 2015 Resort makeup design. Karl Lagerfeld turned to Tom Pecheux to help paint his oriental vision for his show in Dubai. Do you think this "swallowtail" look is a manageable alternative to the classic winged liner? Slash can we please start putting gold leaf everywhere? p.s. I would like to note that although I'm a huge tiara fan, these headdresses are a little too Sailor Moon for me.